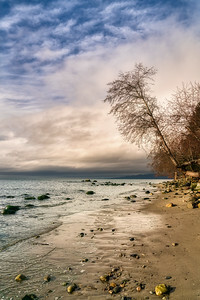 This is a section of Wreck Beach near the University of British Columbia. It's secluded which accounts for it being a favorite among nudist. I visited it fully clothed in winter. I like this in a geeky kind of way because both the foreground and background elements appear in focus. It's also very different than the beaches back home in Florida. Sometimes I post photos just for the scenery and memory, and I suppose this is one of those. Thank goodness for old photos, I would forget so much without them. There is so much going on in the present, that the past gets crowded out. Not that I want to live in the past, but pictures pull together things I've done and places I've been which helps provide the backstory to where I am today. On the east side of Vancouver is an old steam clock. In the Steampunk universe, these things are commonplace. Everyone stands around and waits and, after about fifteen minutes or so it gives off steam. In the age Apple Watch, it's fascinating to watch a relic mark the hours by vapor and gears. 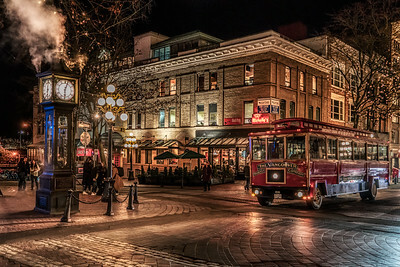 The area is known as Gastown, and it has a lot of places to hang out. You could eat at a different place each night of the year. Whenever I'm in town, I come here and shoot night scenes. It's been a few years so I can't wait to come back. And unlike the glass towers a few blocks away, this Gastown is in a universe all it's own. About five years ago I took a drive up the coast from Vancouver. I took this at a little community called Lions Bay. This image has been sitting in my rejects file for a year or two. Now and then I look at the rejects and see if I should reconsider any. My perspective changes so much that, given a little time, I might change my mind. To be clear, most of my photos deserve to be in the dust bin; they are not that interesting. I usually wait at least a week, typically much longer, to post a photo. It takes a little time to look at a picture dispassionately and decide if it rises to the level. But even then, it's all subjective, and what makes a good photo is entirely in the eye of the beholder. I took this about six years ago while staying at the Banff Springs hotel in Alberta. This was out back facing the conference area. 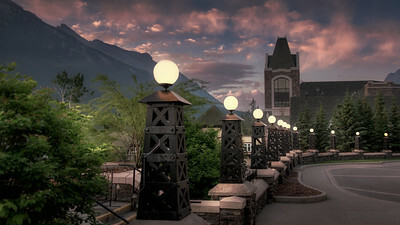 The Banff Springs is a massive property with majestic views of the Canadian Rockies on all sides. While there I walked around taking shots of everything. This image has a nice leading line and captures some of the environmental elements. I've had three bracketed frames in my archives for a long time. 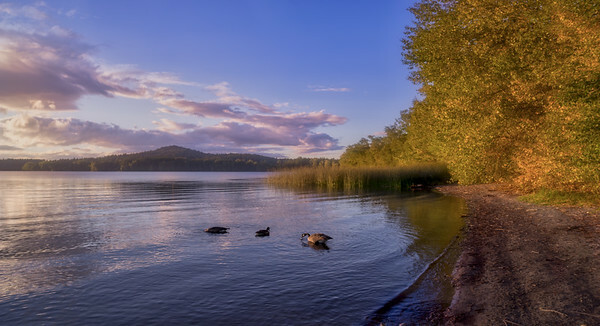 Now that I have the newest Aurora HDR software from Skylum, processing it is easier than ever. I've been going back into the archives a lot lately. It's funny how you see things in a different light over time. I wish I could go back and change my camera settings, but it's also good to notice how my technique has improved. The mountains, on the other hand, have not changed, they are just as majestic as ever. Time for another road trip. 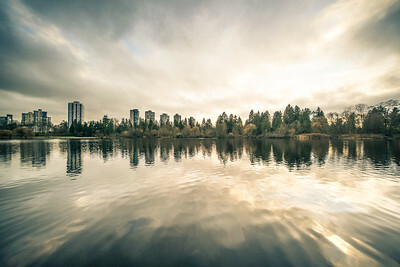 On one side of Lost Lagoon is Stanly Park and on the other is the big city of Vancouver. You can walk from woods to towers in about ten minutes. The name "Lost Lagoon" comes from a poem written by Pauline Johnson (https://en.wikipedia.org/wiki/Lost_Lagoon#Naming_and_history) and laments how she lost the use of the lagoon for canoeing when the tide was out. I looked up that bit of trivia, so now we all know the origins of the name. The lagoon is now a lake cut off from the bay, so presumably, you can canoe without worrying about the tides. Usually I might try to frame a shot like this using the rule of thirds, but in this case, the reflections produce a beautiful symmetry. In my mind its a kind of urban dreamscape. A few years ago I took a seaplane flight over Vancouver and the surrounding islands. I captured this image as we climbed out of the harbor and circled back over the city. I had the back row seat to myself and could slide from side to side to take photos. It was as good as being in a helicopter. I used to come up here regularly and walked nearly every street in the city. But that's not unusual, it's a bike and pedestrian friendly town, so people walk or ride everywhere. Since I took this almost three years ago, the skyline has changed a little. 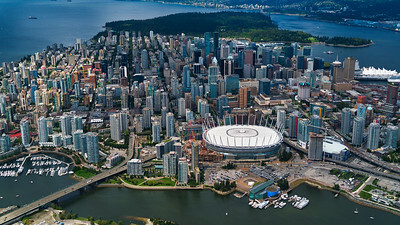 But much of it is the same and landmarks like the BC Place arena, Stanley Park and the Lionsgate Bridge will probably not change for a very long time if ever. What you don't see are the mountains over on the right. But if you could, you would understand why this is only the half of it. This stand of trees is known as Spirit Island. 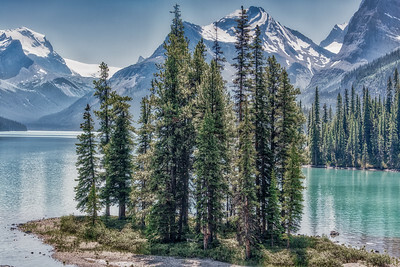 It's one of the most photographed sites in the Canadian Rockies and can only be reached by boat. You can trek here as well, but be sure to bring bear spray. Even so, if I were backpacking, I'd want to do it here. You can't get the proper scale of the peaks from a photo; it's beyond belief. I took this over five years ago with my old Nikon D800 which I've since sold. It's not the camera that matters but what's holding it. I've changed a lot, and so have my techniques, so I need to give it another go. In the meantime, it's still fun to look at these and go back in time to a place that hasn't changed since then, or hundreds of years prior for that matter. 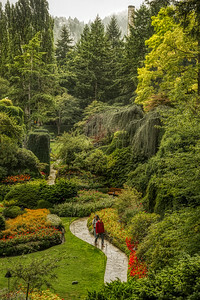 This is Butchart Gardens in Victoria, BC. It's been cultivated for a hundred years on what used to be a limestone quarry. Now is a garden of Eden. I took this nearly five years ago when we spent a couple of weeks on the island exploring. And it's a reminder that I should go back, you can never go wrong with a camera here. As I recall, the smokestack in the back is a leftover from the industrial legacy. Imagine creating one of the worlds most beautiful gardens on an old industrial site. Now imagine if we did that all over the world. Then we truly would have the garden of Eden all over. If only. 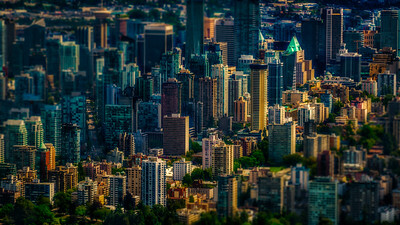 This image I took from a seaplane over Vancouver BC. It was a sightseeing trip, and I happened to be the only customer. Rather than sit up front with the pilot, I opted for the back so I could slide from side to side taking pictures. Small aircraft is the best way to get pictures of a city. It's also the most expensive so, if your objective is to take photos, it helps to have a plan of attack. For me, that means using shutter priority to compensate for the vibration of the motor. We flew out over the water and then over a bunch of islands that surround Vancouver. Until that time I never realized how many isles existed nearby. Months later when I returned for a cruise, we sailed past many of them as we headed towards Alaska. This flight lasted about an hour and, the whole time I was snapping away non-stop. I got a lot of pictures from the islands, but my favorite were those like this one right over the city. I took this image as I disembarked from the ferry to Victoria a few years ago. That was my first time visiting Vancouver Island, and I remember being thrilled at all the new sites. So, before arriving in town, we stopped here to walk around and take pictures of the scenery. I used my first mirrorless camera, the Sony A7R. Now, as I go back and look at old photos I haven't processed, I'm surprised at how well the images hold up, even against newer cameras. So I find myself going back to explore old RAW files with more modern tools and each time, I come away with few surprises. The trip was the beginning of a week on the island, and some of my all-time favorite images came from that trip. There are different climates all across the island, and the geography varies widely. As a result, I was pulling over all the time to take pictures. That meant it took us hours to get anywhere, but since we weren't on a schedule it wasn't a problem, until the last day when we had to be at the terminal on time for the ferry back. That's when I got a speeding ticket, but that's a story for another day. I took this picture in the lobby of the Delta Toronto Marriott when I was there a few months ago. 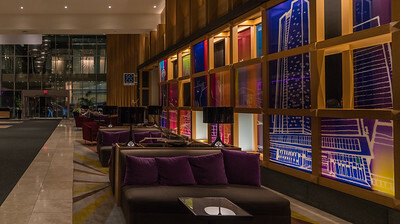 Have you ever noticed how hotels design lobby spaces to feel inviting? This one is a far cry from the Motel 6 we stayed at when I was a kid. When I'm in a big city, I like walking into lobbies and taking pictures of the architecture. The lobby is where the hotel puts its best foot forward. The idea is to convey a sense of luxury and comfort at the same time. Comfort usually means plush furniture and pillows that make you want to sink into them. Anyway, I was walking through in the evening, and the colors caught my eye. I had been sitting here a few hours earlier to meet someone, but hardly noticed it in the daylight. I'm continually surprised at how light affects a place. In my opinion, it's the key to photography. On the top floor, there is a lounge with a spectacular view of the CN Tower. And my room had a pretty nice view of the lake as well. I think the hotel is rated four stars, but from a photographic perspective, it's easily a five. Earlier in the year, I was up in Toronto for a quick stay, and at night I wandered around taking photos. 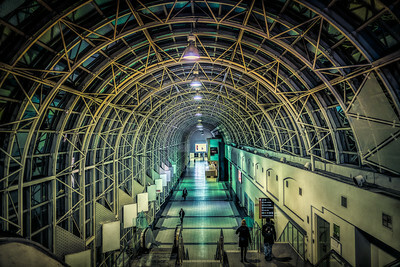 This arched walkway is a connector between the convention center and Union Station. Little did I know that this is also where I would catch the train to the airport in the morning. So I ended up at this same spot eight hours later to grab an early flight home. It was a good idea because a snow storm came in that night and the streets were a mess, but the trains kept rolling. The flight ended up getting delayed anyway, but at least I was at the gate on time. I used to live in Toronto a long time ago, and I'm sure I walked through this spot at some point. But this time I had my camera, and it seemed new to me. 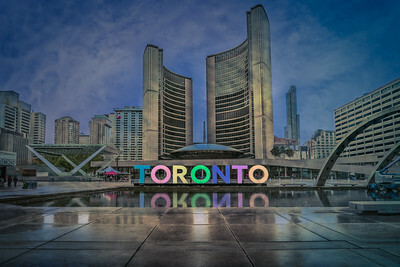 Nevertheless, much of downtown Toronto is connected by covered or underground walkways because of the long winters. I think we should do the same thing down in Florida for the long hot summers. Or, maybe not, we probably spend enough time indoors as it is. 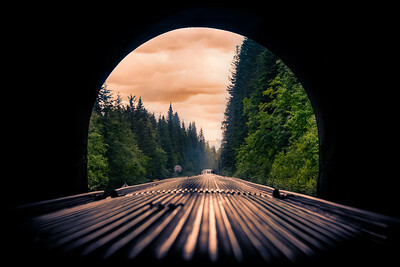 In this case, the light at the end of the tunnel was the Canadian Rockies. If it’s not already, put a train ride through the Rockies on your bucket list. You won’t regret. 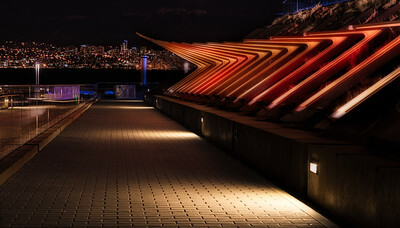 The walkway is in a familiar spot of downtown Vancouver that looks across the bay to West Vancouver. If you look closely, you can barely make out the snowcapped peaks rising above the city. I’ve wandered here many times for the view but this was my is my first attempt at capturing it. It’s part of a structure that houses the Cactus Club Café but also has a walkway on the roof made of grass. It’s next to the conversion center which also has a grass roof. The whole place is unique, but if you live here or have visited a lot like me, this gets overlooked. Everywhere you look in this section of town is unusual architecture and public art. It’s a feast for the eyes that’s balanced by the natural scenery. Just another little vignette of Canada’s west coast city by the sea. This is from Cathedral Grove in British Columbia. It’s a relatively small area filled with Douglas Fir and Red Cedar. Some of the trees are 800 years old and 250 feet high. The forest is considered rare and endangered, the trees are prized by the logging industry. You can find out more about that here. (http://www.cathedralgrove.eu/Index.htm) Having walked through it on a couple of occasions I can say there is a special feeling you get. There aren’t many places like this remaining on the planet, so I hope we can preserve it and the forests around it. We passed by here on our way to Ucluelet from Nanaimo on Vancouver Island. We were so moved by the size and grace of the trees that a week later we stopped again on the way back. On each occasion, we walked in quiet reverie induced by our surroundings. I took a lot of pictures and am just now getting back to some of these images that remind me of this special place. I posted an image of this building last week. Since then I pulled this older one out of my archives and reprocessed it. It's the first image I took of the World of Science building, however since then I've made many more. I was using a Nikon at the time which I later upgraded to a Sony; not that the choice of the camera matters at all. Here is my original take on it (https://www.flickr.com/photos/justenoughfocus/9109050970/in/dateposted/). I don't reprocess images too often, but every once in a while I wonder what it would look like with newer software and updated sensibilities. My sensibilities are like software; they get upgraded every year or two as well. Because of its shape and location by the water, there are no bad angles. You could make a study of this building from different perspectives which is what I've done over the years. With the amount of construction in Vancouver, it seems that even the view gets upgraded every other year. 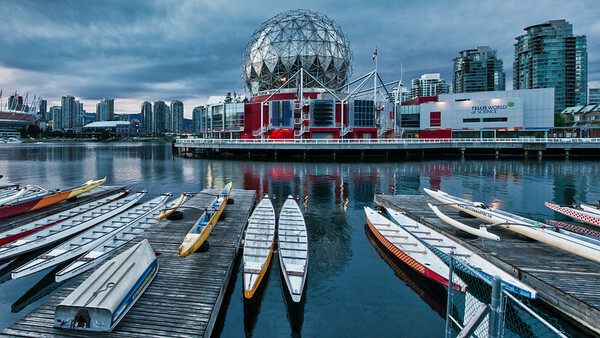 The geodesic dome on the right is the Telus World of Science. I took this photo while standing on the Cambie Street Bridge in Vancouver. 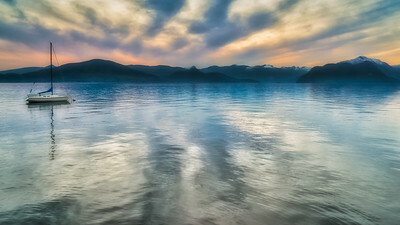 I've made different shots over the years, here is one (https://justenoughfocus.smugmug.com/Portfolio/Canada/i-tVSr2t5/A) and here is another (https://www.flickr.com/photos/justenoughfocus/9109050970/in/dateposted/). To Vancouverites, this is a typical scene; in fact, the sight is just part of the scenery. That's true of anything we see day-in-day-out. But when I come back after being away, walking across the bridge at night is one of my favorite past times. In fact, you can walk all over Vancouver; you don't need a car. I rarely rent one when I'm here unless I'm traveling outside the city. Mostly I take the Skytrain which you can see in this picture. Anyway, the building is a science museum and is an icon of the city. I've spent a lot of time around it just taking pictures. It's an easy thing to do; and as its a geodesic dome, there aren't any bad angles. 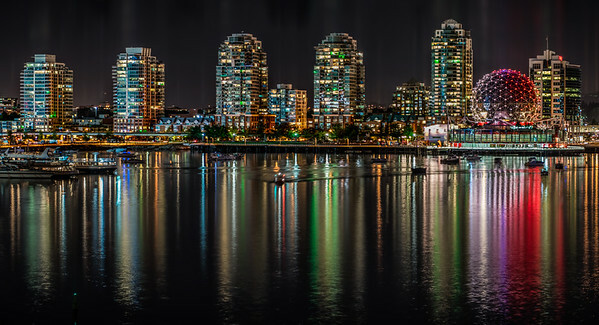 Nevertheless, one of my favorites is from the Cambie bridge like this. I took this about four years ago when I was in Ucluelet on Vancouver Island. 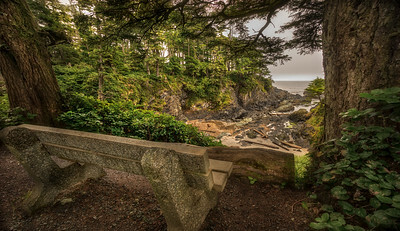 It's a part of the Wild Pacific Trail that traces the coastline. It's a well-maintained trail with benches like this every half mile or so. I was here in late August (or "Fogust" as the locals say) when a thick fog would roll in most afternoons. You could see it sitting just offshore, and then at the right time it would approach and before you could say Foghorn Leghorn, you were in it. In this image, you can see it about a mile offshore. Benches or empty chairs in an image allow us to imagine sitting there in the scene. Our eyes follow the direction it points, similar to a leading line, only with a different device. When a photo makes us look in a particular direction, it has captured our imagination as we weave our own story in the scene. However, if it has thick fog, that would be something different entirely. 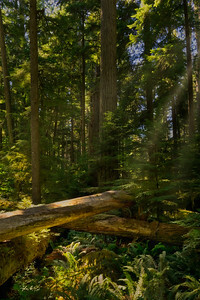 Here is another image from Cathedral Grove on Vancouver Island. I cannot fathom living eight-hundred years. Imagine the stories these trees could tell. After that length of time, I suppose the stories would go on and on. After looking at these images, I am pining to go back. Knock on wood I’ll have a chance soon. Short of that, I’ll just have to lumber along here in Florida. Forgive me dear blog reader, you do not deserve to be pun-ished this way. One good thing about living eight-hundred years is that the statute of limitations is on your side. Whatever you did in the last century is forgotten, unless, of course, you’re a tree. In that case, your neighbors know your business. Do trees forget? If you’ve found this blog post informative, then I’m clearly not doing my job today. You’ll never guess where this is from. If you need a hint, look for the flag. But seriously, the rain should give it away for sure. I was wandering around the downtown part of the city on a Sunday morning before my flight home. When I arrived here there was no one around on account of the rain. But, being an iconic spot, within three minutes a bus full of Chinese tourists arrived and started taking selfies. It was a comical scene and so I sat on a bench to watch the ensuing chaos. Five minutes later they climbed back onto the bus and were off to the next location. Iconic locations are fun to shoot, and with a little effort, you can add your own spin. Many famous photographers seek out the same landmarks around the world. I’m not super motivated to do that. But if I happen to be there then why not, it’s still fun. In fact, it can be more fun to shoot the people at an iconic location than the location itself. Wished I’d thought of that before I took this. 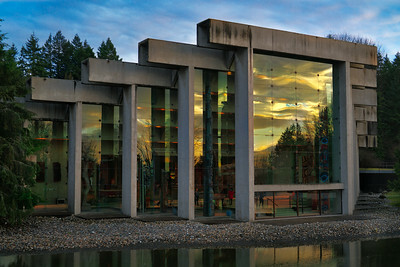 This is a section of the Arthur Erickson (https://www.arthurerickson.com/) designed Museum of Anthropology in Vancouver. To be clear, I didn’t know about the architect until just now when I looked him up. But if you’re like me, you’ll recognize his work in other major cities. He even has a blog on Tumblr. Say what? (http://arthur-erickson-officialblog.tumblr.com/) This makes me realize there are so many things I don’t know. It’s a revelation to learn that things I’ve regularly seen have something in common. Each one is so unusual that I’ve wondered about it, only to become aware of the threads when pointed out. It makes me wonder how many other things have unseen associations. Intuitively I feel this must be the case on many levels; there are more associations in life than we will ever consciously know. For me, one of the little pleasures in life is the revelation that comes with seeing the bigger picture. 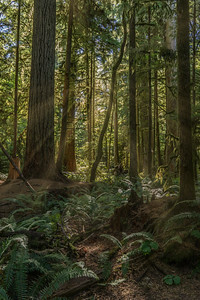 Here is another image from Cathedral Grove on Vancouver Island. I cannot fathom living eight-hundred years. Imagine the stories these trees could tell. After that length of time, I suppose the stories would go on and on. After looking at these images, I am pining to go back. Knock on wood I’ll have a chance soon. Short of that, I’ll just have to lumber along here in Florida. Forgive me dear blog reader, you do not deserve to be pun-ished this way. One good thing about living eight-hundred years is that the statute of limitations is on your side. Whatever you did in the last century is forgotten, unless, of course, you’re a tree. In that case, your neighbors know your business. Do trees forget? If you’ve found this blog post informative, then I’m clearly not doing my job today.